Yanbu' al Bahr (Arabic: ينبع‎ "spring bi the sea"), an aa kent simply as Yanbu, Yambo or Yenbo, is a major Red Sea port in the Al Madinah Province o wastren Saudi Arabie. 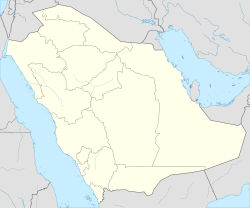 It is approximately 350 kilometers north o Jeddah (at 24°05′N 38°00′E﻿ / ﻿24.083°N 38.000°E﻿ / 24.083; 38.000). The population is 188,430 (2004 census). A lairge number o the residents are foreign expatriates, maistly frae Asie, but there are an aa lairge numbers frae the Middle East an Europe. The ceety is dividit intae three veelages, aboot 15 minutes drive bi caur away frae each ither. The Dountoun (aften cawed Al-Balad) is the actual ceety an haes maist o the population wi aw the shoppin centers. The majority o the residents are lawer class an income Asians, lawer class an lawer income Saudi Arabians, an some non-Saudi Arabs an ither Middle Easterners. Vera few Wastreners live in this pairt o Yanbu. Maist o the restaurants here are lawer class an cater tae the various ethnic groups in the aurie. The aurie does contain a few internaitional chain restaurants, as well as some coffee shops. Pairts o the ceety, pairticularly on the edge o the ceety, are stairtin tae modrenize, as new shoppin centers as well a new shoppin maw are being biggit. The aurie as a whole, housomeivver, haes a rather auld, worn oot feel tae it. at the time bein govrenment wirk oot tae improve the auld an historical part in yanbu doun toun , whaur ye can fynd the pretty auld biggins wi aw its auld pretty accessories. Al-Nakheel (The Palms) is the aulder pairt o the ceety, whaur maistly ferms wad be foond. Ony residents here wad be exclusively Saudi Arabian. Yanbu Al-Sina'iya (literally "the industrial Yanbu"), is the industrial ceety, established aroond 1975 wi a vera modren hoosin airchitectur. It hooses aw the major refineries an petrochemical installations an is still experiencin major growth. The industrial ceety haes a section cawed the Royal Commission. It's residents are made up maistly o Europeans, Americans, an ither Wastreners. There are an aa many upper-class Saudi Arabians, upper income non-Saudi Arabs, an upper income Asians. Although the Royal Comission is maistly residential, there are mony internaitional chain restaurants, as well as a shoppin maw, supermercats o various sizes, hospitals, banks, an coffee shops. It haes a mair modren, clean, an mair organized feel tae it than the Dountoun aurie. It is an aa mair green. Yanbu is an important petroleum shippin terminal an is hame tae three ile refineries, a plastics facility an several ither petrochemical plants. It is the kintra's seicont port (efter Jeddah) an serves as the main port for the holy ceety o Medina, 160 km (99 mi) tae the east. The natural harbour is protectit on baith sides bi wide coral reefs. These reefs remain maistly untouched makin them excellent auries for divin. Three major ile pipelines lead athort the desert frae the ilefields in the east tae terminate at the Red Sea in Yanbu. Yanbu an aa haes an international airport (code YNB) that wis built in 2009. It anerlie affers flichts tae Riyadh an Jeddah athin Saudi Arabie. Internaitionally, it affers flichts tae Dubai, Unitit Arab Emirates, an tae Cairo, Egyp. A new heich-gate nou passes through Yanbu linkin Jeddah tae the northren pairts o the kinrick an the neighborin kintras Sirie, Jordan etc. The naval base cawed Al-Minhalapin utilizes islands an unnerwater facilities tae protect the landmass. This page wis last eeditit on 10 Mairch 2018, at 20:14.